Special 7- Castle is the final and sixth level of Special 7 in Super Mario 3D Land. It is based off of World 1-Castle. 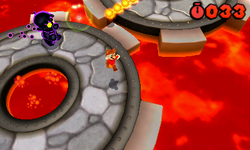 Unlike the other castle levels, there is no boss fight at the end of this level. The player starts off on a platform, and after dropping down from it, a Big Cosmic Clone forms and begins to chase the player onto some gear-shaped platforms that rotate. After this is a platform with two pillars and a Rectangular ? Block, that contains a Statue Leaf on it, which is next to a platform that is then raised by lava. There is then a walkway that leads to a section that has several Brick Blocks and Pillars on it which block the player's way. After this section is the bridge that leads to the Warp Box and the Goal Pole. Star Medal 1: The first Star Medal is floating above a pillar that is next to a Rectangular ? Block. Star Medal 2: The second Star Medal is floating in a small indent in a wall. Star Medal 3: The third Star Medal is floating next to some Pillars that need to be Wall Jumped off of.